There are two archives accessible from this page. One is an archive of the data set constituting all information associated with the Spalding-Shreve plant-monitoring program at the U.A. Desert Laboratory in Tucson from 1906 through the updated 2012 census. This is the oldest individual-based plant monitoring program in the world (Rodriguez et al. 2013). Analyses derived from these data have been historically pivotal in testing theories on plant succession, life history traits, longevity, and population dynamics (see Shreve and Hinckley (1937), Murray (1959) and Bowers (2002 and 2005 a, b), Goldberg and Turner (1986), and Butterfield et al. (2010)). This archive was recently published as an Ecology Archives Data Paper and can be accessed at this link: One hundred and six years of population and community dynamics of Sonoran Desert Laboratory perennials. The second archive describes a long-term data set on the population dynamics of desert annuals collected by D. L. Venable at the Department of Ecology and Evolutionary Biology, University of Arizona. It can be accessed at this link: Desert Annual Archive. The data is presented in Ecology Archives Data Paper format with metadata following Michener et al. (1997). All data files are in .csv format. Below is a brief description of some of the research we have done in relation to this data set. Population and community ecology of desert winter annuals - The main goal of this research was to determine how desert annuals adapt to and coexist in variable and unpredictable environments. The resulting long term population and community dynamic data has formed the backbone of a synthetic research program on desert annuals combining evolutionary, physiological, population and community ecological approaches to answer questions uniting functional biology, life history evolution and community dynamics. The core data set –In 1982 I began censusing permanent plots along a 250 m transect through a gently sloped creosote flat (half under shubs and half in the open). Each year plants of all desert annual species have been mapped at germination and censused for survival to reproduction, and per capita fecundity. Also, soil cores are collected immediately following the germination season to estimate the density of viable seeds in for each species. 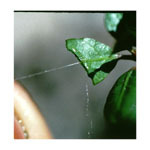 Demography –Germination typically occurs from October through January. Plants grow and reproduce until the season ends in April when it becomes hot and dry (Venable and Pake 1999). These winter annuals tend to survive and reproduce well in wet El Niño years (Venable and Pake 1999, Venable 2007; Fig. 1). Figure. 1. Example of weather linkage. Jan-Mar precipitation in Shismus barbatus. However, exceptions exist and species have individualistic responses to temporal variation (Venable et al. 1993, Pake and Venable 1995, Venable and Pake 1999). The total number of seedlings of all species emerging has varied by more than two orders of magnitude over the 24-year period with a multidecadal decline evident (Fig. 2). Southern Oscillation Index are also plotted. Competition –Competition was investigated with neighborhood designs. These demonstrated species specific competitive responses that varied with habitat and year but equivalent effects of competitors as neighbors (Pantastico 1991, Pantastico-Caldas and Venable 1993). Experiments have demonstrated environment specific reversals in competitive superiority which should contribute to species coexistence (Pake and Venable 1995). Dynamic models of this system show that coexistence is dependent on subtle aspects of species biology and that species x time or space interactions for both germination and competitive success contribute to coexistence (Venable et al. 1993). Germination in field and lab –We quantified seed banks to test for delayed germination which is predicted by bet hedging theory and to test for species differences in germination responses that could contribute to species coexistence mechanisms. Germination fraction is the fraction of viable seeds in the soil that germinates in a given year. There is a highly significant interaction between species and year, indicating that species have different germination responses as required for species coexistence via the storage effect (Pake and Venable 1996). This long-term data in undisturbed and unmanipulated natural populations gives a rare insight into germination biology in a guild of plants in nature. In growth chambers we subjected seeds of eight species to germination conditions likely to be encountered in the field (Adondakis and Venable 2004). We found a complex array of contingent germination strategies implying that different field conditions should lead to different patterns of germination and community composition. Seed age structure in the field –We developed a technique using Tandem Accelerator Mass Spectrometry capable of aging individual desert annual seeds using the spike in atmospheric C14 following 1960’s nuclear bomb tests as a reference point (Moriuchi et al. 2000). We used this to reconstruct seed bank age structure. Seed dispersal –The magnitude of seed dispersal is critical for understanding how plants adapt to (Venable and Brown 1993) and coexist in variable environments (Chesson 2000b). We developed a novel inverse modeling technique for estimating dispersal kernels using reproductive suppression on one side of a boundary (Venable et al. 2008). Most seeds traveled less than a meter. Longer distance dispersal via sheet wash depends on local microtopography and occasional heavy rains. This suggests that local population buildup is likely to impact these communities, possibly enhancing species coexistence due to spatial environmental variation (Chesson 2000b). Escape in time appears more important for seeds of desert annuals than escape in space (cf. Ellner and Shmida 1981, Venable et al. 2008). Bet hedging –Evolutionary bet hedging encapsulates the counterintuitive idea that organisms evolve traits that reduce short-term reproductive success in favor of longer-term risk reduction (Seger and Brockmann 1987). While it has been widely investigated, long-term data on demographic variation from evolutionarily relevant environments has been unavailable to test its mechanism (Hopper 1999, Evans and Dennehy 2005). Using the LTREB data I have found an association between delayed germination (a bet hedging trait) and risk (Fig. 3, Venable 2007). This provides a definitive test by quantifying with long-term data the purported selective mechanism in the evolutionarily relevant environment (cf. Clauss and Venable 2000). The results are corroborated by related studies that are spinoff’s of the LTREB project (Clauss 1999, Clauss and Venable 2000, Evans et al. 2007). exp(SD(ln(average number of seeds per germinating seed))). r = -0.78; P < 0.005. Species and year bootstraps highly robust. +/- one bootstrapped SD. From Venable (2007). Species coexistence –Ecologists have long been interested in the role of temporal variation in promoting species coexistence (Hutchinson 1961) and desert annuals have been an important theoretical model system (Shmida and Ellner 1984, Warner and Chesson 1985, Ellner 1987, Chesson and Huntly 1988, Chesson and Huntly 1989, Chesson 1994, Chesson 2000a, Chesson 2000b). Two scenarios are relevant to testing for the importance of the storage effect as a mechanism of coexistence in desert annuals. Species coexistence is promoted if a set of species produce persistent seed banks with variable germination fractions that are not completely correlated (Chesson and Huntly 1988, Chesson and Huntly 1989). Following (Chesson 2000b), we have shown that the coexistence promotion (rare species advantage) from this mechanism is an approximately 4% growth rate advantage on average for the species in this guild (Venable et al. 1993, Pake and Venable 1996, Angert et all, In review.). A second scenario involves per capita reproductive success that is not completely correlated among species (Venable 1989, Venable et al. 1993, Pake and Venable 1996, Angert et all, In review.). The rare species advantage contributed by this mechanism is an additional 3% for a total 7% rare species advantage (i.e., average low density lambda= 1.07 compared to a long-term average of 1.0). Functional biology of community dynamics –This research aims to determine how plant functional traits result in the divergent demographic patterns that contribute to species coexistence. We have examined interspecific variation in resource uptake and resource allocation traits to test the hypothesis that fundamental tradeoffs in plant function organize communities. The community appears to be organized by an interspecific tradeoff between water use efficiency (WUE) and relative growth rate (Fig. 4, Venable and Brown 1988, Angert et al. 2007, Huxman et al. 2008, Barron-Gafford et al. in review). We have found that species contributions to the species by year interaction (which determines coexistence) is highly correlated with species position along this tradeoff (Mantel test, P < 0.002, Angert et al. In Review). This demonstrates how fundamental tradeoffs in plant physiological processes mediate species coexistence mechanisms, i.e., the functional biology of community dynamics. related to relative growth rate (R2=0.93, P <0.0001). Community genetics – This spin-off of the LTREB research aims to determine the genetic structure of relative growth rate (RGR) and integrated water-use efficiency (WUE) covariation. Ecologists have hypothesized that many of the tradeoffs that shape life histories, interspecific interactions, mechanisms of coexistence, and community structure are due to the same pervasive, underlying constraints (Grubb 1977, Chesson and Huntly 1988, Tilman and Pacala 1993, Venable et al. 1993, Turnbull et al. 1999, Rees et al. 2001, Suding et al. 2003). However, tradeoffs described at different scales may not be wholly transitive. For example, a within-species tradeoff might be set by biophysical constraints as to what can be built with a given amount of resources (construction constraint). Yet an interspecific community tradeoff might be set by assembly rules of what can coexist (assembly constraint). We are measuring the phenotypic and genetic correlation structures of these traits within four of the LTREB species to test the hypothesis that the tradeoffs organizing communities are the same underlying tradeoffs that constrain life history evolution. water use efficiency due to underlying constraints found within species? Impact on ecosystem processes and co-occurring perennials –Little is know about the effect of desert annuals on perennials and ecosystem function even though there is some indication that annuals may negative impact the water status, growth and reproduction of perennials (Holzapfel and Mahall 1999), as well as the availability of soil nitrogen (Mun and Whitford 1997). We are using the long-term LTREB annual plant removal plots with matched controls to investigate interactions with perennial vegetation and ecosystem processes (Tyler et al. In Prep.). Soil water availability, stomatal conductance and photosynthetic gas exchange of perennial plants like Larrea tridentata decline in the presence of large numbers of annuals. Annuals also increased both soil carbon and nitrogen and resulted in up to a threefold increase in nematode abundance. This work is unique in combining the effects on soil nutrients and water status with the effects on creosote water stress and photosynthetic function. Adondakis, S., and D. L. Venable. 2004. Dormancy and germination in a guild of Sonoran Desert annuals. Ecology 85:2582-2590. Angert, A. L., T. E. Huxman, G. A. Barron-Gafford, K. L. Gerst, and D. L. Venable. 2007. Linking growth strategies to long-term population dynamics in desert annuals. Journal of Ecology 95:321-331. Angert, A.L., T. E. Huxman, P. Chesson, and D. L. Venable. In Review. Functional tradeoffs determine species coexistence via the storage effect. Nature. Barron-Gafford, G. A., A. L. Angert, D. L. Venable, A. P. Tyler, K. L. Gerst, and T. E. Huxman. in review. Photosynthetic temperature responses of desert annuals with contrasting resource-use efficiencies. Oecologia. Bowers, J. E. 2005. Effects of drought on shrub survival and longevity in the northern Sonoran Desert. Journal Of The Torrey Botanical Society 132:421-431. Bowers, J. E., and R. M. Turner. 2001. Dieback and episodic mortality of Cercidium microphyllum (foothill paloverde), a dominant Sonoran Desert tree. Journal Of The Torrey Botanical Society 128:128-140. Bowers, J. E., and R. M. Turner. 2002. The influence of climatic variability on local populations dynamics of Cercidium microphyllum (foothill paloverde). Oecologia 130:105-113. Bowers, J. E., R. M. Turner, and T. L. Burgess. 2004. Temporal and spatial patterns in emergence and early survival of perennial plants in the Sonoran Desert. Plant Ecology 172:107-119. Chesson, P. 1994. Multispecies Competition In Variable Environments. Theoretical Population Biology 45:227-276. Chesson, P. 2000a. Mechanisms of maintenance of species diversity. Annual Review of Ecology and Systematics 31:343-366. Chesson, P. 2000b. General theory of competitive coexistence in spatially-varying environments. Theoretical Population Biology 58:211-237. Chesson, P. L., and N. Huntly. 1988. Community Consequences Of Life-History Traits In A Variable Environment. Annales Zoologici Fennici 25:5-16. Clauss, M. J. 1999. Life history strategies in variable environments. Ph.D. Dissertation. University of Arizona, Tucson. Clauss, M. J., and D. L. Venable. 2000. Seed germination in desert annuals: An empirical test of adaptive bet hedging. American Naturalist 155:168-186. Ellner, S. 1987. Alternate Plant Life-History Strategies And Coexistence In Randomly Varying Environments. Vegetatio 69:199-208. Ellner, S., and A. Shmida. 1981. Why are adaptations for long-range seed dispersal rare in desert plants. Oecologia 51:133-144. Evans, M. E. K., and J. J. Dennehy. 2005. Germ banking: Bet-hedging and varlable release from egg and seed dormancy. Quarterly Review Of Biology 80:431-451. Evans, M. E. K., R. Ferriere, M. J. Kane, and D. L. Venable. 2007. Bet hedging via seed banking in desert evening primroses (Oenothera, Onagraceae): Demographic evidence from natural populations. American Naturalist 169. Grubb, P. J. 1977. Maintenance Of Species-Richness In Plant Communities - Importance Of Regeneration Niche. Biological Reviews Of The Cambridge Philosophical Society 52:107-145. Holzapfel, C., and B. E. Mahall. 1999. Bidirectional facilitation and interference between shrubs and annuals in the Mojave Desert. Ecology 80:1747-1761. Hopper, K. R. 1999. Risk-spreading and bet-hedging in insect population biology. Annual Review Of Entomology 44:535-560. Hutchinson, G. E. 1961. The Paradox Of The Plankton. American Naturalist 95:137-145. Huxman, T. E., G. A. Barron-Gafford, K. L. Gerst, A. L. Angert, A. P. Tyler, and D. L. Venable. 2008. Photosynthetic resource-use efficiency and demographic variability in desert annuals. Ecology 89:In Press. Michener, W. K., J. W. Brunt, J. J. Helly, T. B. Kirchner, and S. G. Stafford. 1997. Nongeospatial metadata for the ecological sciences. Ecological Applications 7:330-342. Moriuchi, K. S., D. L. Venable, C. E. Pake, and T. Lange. 2000. Direct measurement of the seed bank age structure of a Sonoran Desert annual plant. Ecology 81:1133-1138. Mun, H. T., and W. G. Whitford. 1997. Changes in mass and chemistry of plant roots during long-term decomposition on a Chihuahuan Desert watershed. Biology And Fertility Of Soils 26:16-22. Pake, C. E., and D. L. Venable. 1995. Is Coexistence Of Sonoran Desert Annuals Mediated By Temporal Variability In Reproductive Success. Ecology 76:246-261. Pake, C. E., and D. L. Venable. 1996. Seed banks in desert annuals: Implications for persistence and coexistence in variable environments. Ecology 77:1427-1435. Pantastico, M. C. 1991. Competition in desert winter annuals: effects of spatial and temporal variation. Ph.D. Dissertation. University of Arizona, Tucson, AZ. Pantastico-Caldas, M., and D. L. Venable. 1993. Competition in two species of desert annuals along a topographic gradient. Ecology 74:2192-2203. Pierson, E. A., and R. M. Turner. 1998. An 85-year study of saguaro (Carnegiea gigantea) demography. Ecology 79:2676-2693. Rees, M., R. Condit, M. Crawley, S. Pacala, and D. Tilman. 2001. Long-term studies of vegetation dynamics. Science 293:650-655. Shmida, A., and S. Ellner. 1984. Coexistence Of Plant-Species With Similar Niches. Vegetatio 58:29-55. Suding, K. N., D. E. Goldberg, and K. M. Hartman. 2003. Relationships among species traits: Separating levels of response and identifying linkages to abundance. Ecology 84:1-16. Tilman, D., and S. Pacala. 1993. The maintenance of species richness in plant communities. in R. E. Ricklefs and D. Schulter, editors. Species diversity in ecological communities. University of Chicago Press, Chicago. Turnbull, L. A., M. Rees, and M. J. Crawley. 1999. Seed mass and the competition/colonization trade-off: a sowing experiment. Journal Of Ecology 87:899-912. Tyler, A. P., T. E. Huxman, and D. L. Venable. In Prep. Winter annuals effect fertile island development and perennial plant function in the Sonoran Desert. Venable, D. L. 2007. Bet hedging in a guild of desert annuals. Ecology 88:1086-1090. Venable, D. L., and J. S. Brown. 1988. The selective interactions of dispersal, dormancy, and seed size as adaptations for reducing risk in variable environments. American Naturalist 131:360-384. Venable, D. L., and J. S. Brown. 1993. The Population-Dynamic Functions Of Seed Dispersal. Vegetatio 108:31-55. Venable, D. L., A. Flores-Martinez, H. C. Muller-Landau, G. A. Barron-Gafford, and J. X. Becerra. 2008. Seed dispersal of desert annuals. Ecology. Venable, D. L., and C. E. Pake. 1999. Population ecology of Sonoran Desert annual plants. Pages 115-142 in R. H. Robichaux, editor. The ecology of Sonoran Desert plants and plant communities. University of Arizona Press, Tucson. Warner, R. R., and P. L. Chesson. 1985. Coexistence Mediated By Recruitment Fluctuations - A Field Guide To The Storage Effect. American Naturalist 125:769-787.